The Joubert property is situated 55 km NE of the Renard diamond mine which is accessible by Road 167. The property consists of a group of 182 claims, 100% owned by Stelmine and totalling 94.2 km2. The property is located within the La Grande sub-province near the contact with the Opinaca metasedimentary sub-province. Work conducted in 2018 allowed the identification of metasedimentary rocks composed of migmatized cordierite-sillimanite paragneiss and migmatites (Solomon Formation) at the contact with occasionally pillowed metabasaltic rocks (Trieste Formation) and associated with bands of sulphide. In 2018, the results of its exploration campaign completed on the Joubert property in which channel samples provided values of 0.83 g/t Au on 1.5 m and 1.10 g/t Au on 0.25 m. These new gold values support the recent discoveries obtained on the Trieste and Mercator properties in the eastern sector of the Opinaca metasedimentary basin. The analyzed lithologies consist of altered quartz-rich migmatized biotite/hornblende paragneiss containing pyrrhotite and arsenopyrite. Anomalous arsenic concentrations are reported (As between 679 and 2580 ppm). The showings are located 5 to 20 m from the Virginia Mines (2007) outcrops returning values of 4.69 g/t and 0.48 g/t Au obtained from deformed and dismembered quartz veins within pyrite-pyrrhotite-bearing gneiss/migmatites. 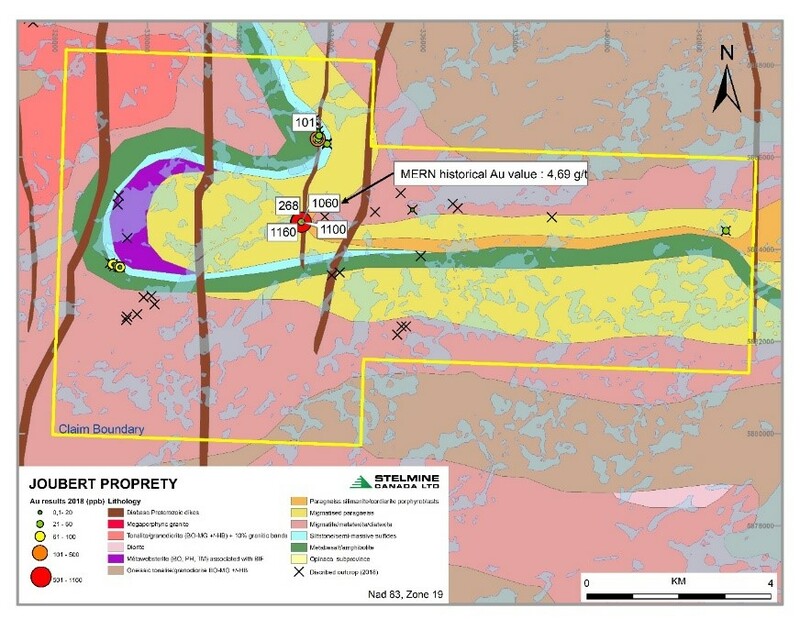 Gold mineralization was discovered in 2017 by Stelmine in the northeast part of the property on a rusty outcrop exposing siltstones/tuffs layers at the contact with metabasaltic rocks. The mineralization is constituted of pyrrhotite, pyrite and chalcopyrite locally massive or injected in fractures. The rock is sometimes silicified, magnetic and contains graphite accompanied by quartz veins. Grab samples provided values of 2.48 g/t Au, 0.16 % Zn, 1440 and 2760 ppm As. The siltstones/tuffs in contact with metabasalts and a websterite intrusive continue westward and veer south then east. This contact constitutes a potential gold target thanks to the occurrence of disseminated to massive sulphide zones showing anomalous Au (0.10 and 0.13 g/t) and Zn (0.1 %) contents.